"Be the first to get a copy of Fashion Revolution’s inaugural zine ‘Money Fashion Power’. Through 72-pages of poetry, illustration, photography, graphic design and editorial, this collectible zine explores the hidden stories behind your clothing, what the price you pay for fashion means, and how your purchasing power can make a positive difference." What's your fashion superpower? Here's a sneak peak at my illustrations for Fashion Revolution's new limited edition fanzine. Want to fix the fashion industry but don't know how? 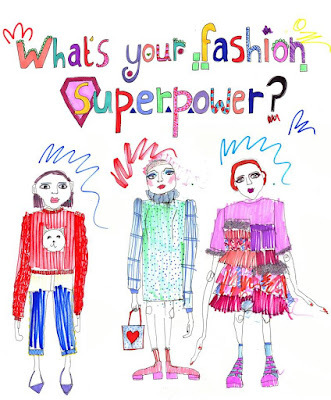 Try the fun quiz to find out your fashion superpower!